The City of Williston knew they needed a redundant transmission main; however, the exact location and alignment needed to be determined. 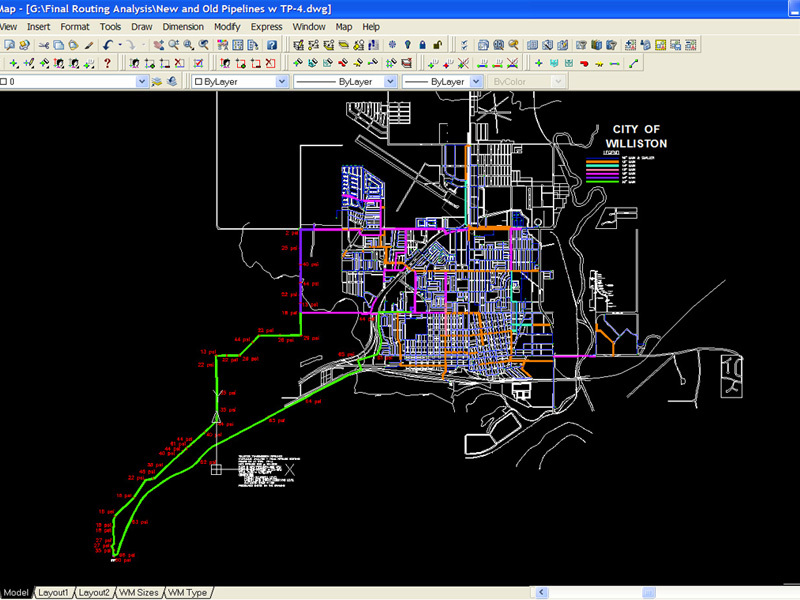 With City staff’s assistance, AE2S developed a hydraulic model of the Williston water distribution system. The hydraulic model was needed to comprehensively evaluate the best alignment for their new transmission pipeline to deliver potable water from the existing water treatment plant to the distribution system. Upon completion of the model set-up and calibration process, the model was utilized to analyze several alternatives and determine the most efficient and beneficial connection points to the existing system. The model calibration process also served as a method to identify system deficiencies and operational recommendations for reservoirs and towers. This project consisted of the following stages: 1) information collection, 2) model development, 3) field data collection, 4) calibration, 5) analysis of the distribution system, and 6) preliminary engineering of the transmission main design. Information was collected by analyzing as-built drawings, pump curves, system maps, water billing data, etc. AE2S developed the model using H2ONET and H2OMAP. AE2S engineers worked with City staff to collect field data by performing fire flow testing at approximately 50 locations within the system and pipe roughness tests on 10 sections of water main varying in type and size. Hydrant pressure recorders were used to collect pressure and flow information during the testing. The hydrant pressure recorders were also placed at six locations within the distribution system for several weeks to collect pressure information needed for calibration. Calibration of the hydraulic model is necessary to allow the hydraulic model to resemble the actual performance of the existing water distribution system. 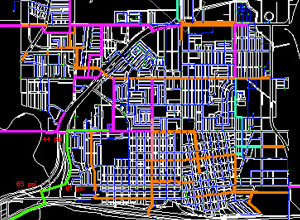 The City of Williston used the model to successfully design the transmission main as well as address numerous questions regarding the operation of their distribution system. Since the completion of the model, the City staff has noticed a reduction in the number of main breaks, which they attribute to a better understanding of their system. In addition, AE2S has assisted the City with questions regarding fire flow, expansion needs and prioritization for capital improvements planning, and impacts of new industry on the City’s water system.